This Page is Dedicated to the soldiers that died at Fort Duffield and West Point, Kentucky. Ennis Church served as Regimental Surgeon for the 9th Michigan Infantry that cold winter in West Point, Kentucky. For most of the green soldiers, this was their first time away from home. Wet ground and freezing temperatures made life in the camps miserable. Few of them knew how to make a proper bunk of straw or rails. The many hardships combined with the less than ideal sanitary conditions proved too much for many of the men. A measles epidemic struck the camps and many of the men developed pneumonia as a complication. The people of West Point opened their homes to these sick men. During this bleak period the Ditto-Lansdale House, on the northeast corner of 4th & Elm, was pressed into service as a military hospital. It was ironic that in many instances the mothers, wifes or sisters of the Confederate soldiers who were off fighting for the South were kindly nursing the U.S. soldiers back to health. Dr. Geoghegan and Dr. Fletcher of West Point assisted Ennis Church in this overwhelming crisis. Among the local women who nursed the sick, under these severe conditions, were Mrs. Guthrie and Miss Mallie. Colonel William Duffield, commander of the 9th Michigan, reported on December 23, 1861 to Brigadier-General John Robertson, "Our sick list is rapidly decreasing and now shows only 156 instead of the 316 as per enclosed monthly return. I have had all the men and officers of this command vaccinated to guard against a visitation from Small Pox which is prevalent in several brigades now in Kentucky." Many of war's casualties were not on the battlefield. 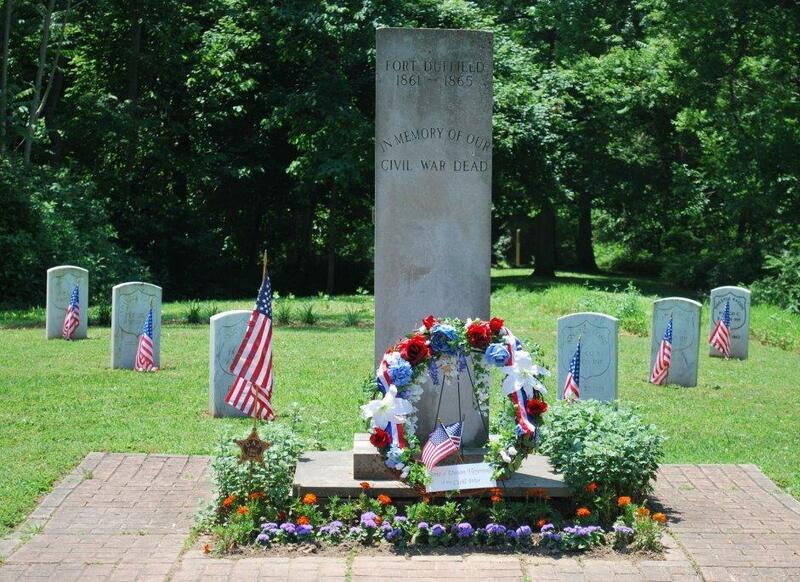 In grateful remembrance, we honor the service and ultimate sacrifice of the men that gave their lives while serving the U.S. at Fort Duffield and West Point, Kentucky. New Albany,Indiana. 27 of the men listed above are included in the Unknown burials. * Also has a memorial headstone in Michigan. ** Reinterred in New Albany National Cemetery,in 1868. ~ Also has a memorial headstone in Fort Duffield Memorial Cemetery.